Hippie clothes. Bohemian clothing. Artsy clothing for expressive women! 100% brushed acrylic handcrafted unisex poncho hoodie made by artisans, Fair Trade. This poncho has two ties on each side to keep your poncho closed. Because of the handmade nature of these ponchos there are inconsistencies present in the weave texture and stitching of the garment common to handmade items. This only adds to the charm of wearing a handcrafted item. The measurements here represent an average of this item taken unstretched. Front pockets, ties at neck, comes with hood. Patterns may vary slightly form picture. 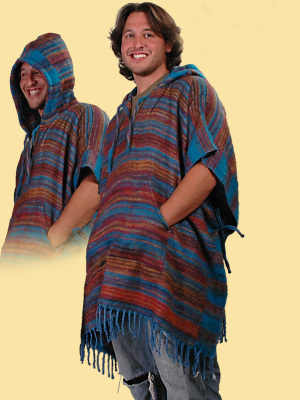 All ponchos are multicolor stripe on solid background. You can choose background color but stipes are all multicolor assorted. Check the measurements below.